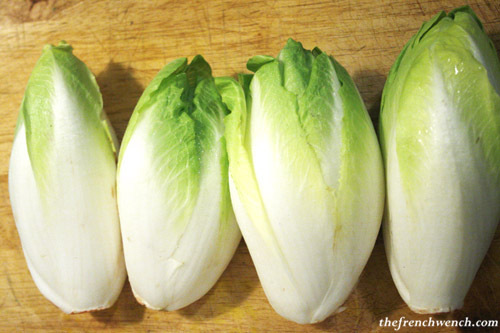 Witlof is actually the root of the chicory plant and is grown as a two-stage crop (see this producer’ website showing the different stages of the production with pictures). The plant is first grown outside for around five months, then the leaves are cut on the surface, the roots harvested and then put in cool storage. They are then taken out of cool storage and stacked in a dark and humid room at around 14°C for around 3-5 weeks (hydroponic rooms). The witlof leaves will start to emerge from the roots (the “forcing” process) and grow to the shape we are familiar with. Witlof needs to be protected from the sun to keep its really white aspect and a mild taste. 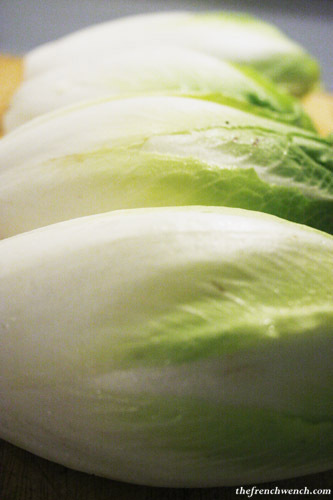 In France we actually say of a pasty person that he/she is “as pale as an endive”. 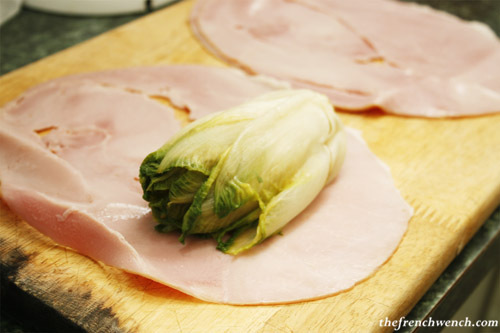 A few weeks ago I stumbled upon some witlof in my local fruit&veg shop and decided to treat myself to a nice dish of “Endives au jambon” (Ham Witlof). 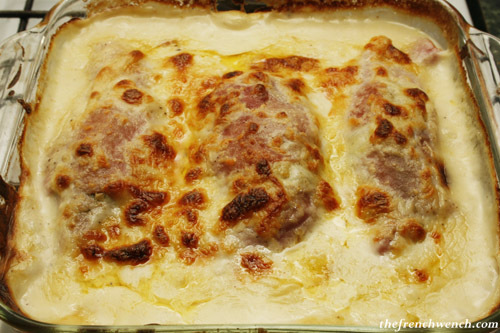 My mum used to make this recipe at home all the time, it is fairly easy and very comforting: perfect for these last cool evenings of the season… but really, any excuse will do for a dish with Bechamel sauce! I then roll each endive into a slice of ham and place them in the baking dish. After pouring the sauce evenly all over the endives and sprinkling generously more cheddar cheese (you can also use gruyère or parmesan if you prefer), place the dish in the oven at 180 degrees for about 20-25 minutes, or until the surface is golden brown and crispy. 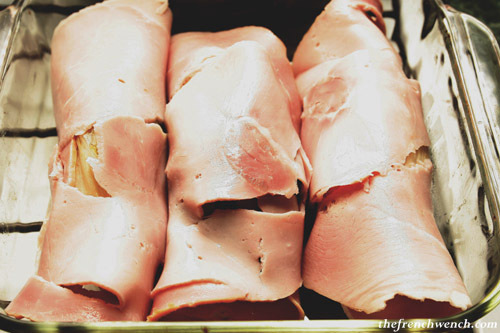 You can let it rest for a few minutes when taking it out the oven, as the endives inside the ham will be very very hot! Et voilà, it is ready to eat! 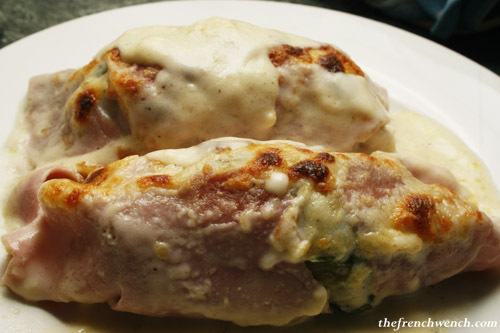 I admit this is not the best looking dish around, but what it lacks in presentation, it makes up for it in flavour: the association of the Bechamel’s creaminess with the ham’s saltiness and the witlof’s bitterness works wonders… bon appétit! 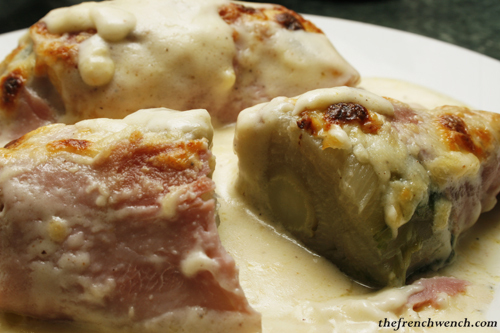 This entry was posted in Recipes and tagged Bechamel, Belgium Endive, Gratin, Ham, Recipe, Witlof. Bookmark the permalink. Yumm. I seem to remember having something very like this in Romans-sur-Isere. Yes Philip you probably did ! it’s a very good and warming winter dish ! Sandra yours looks very yummy ! 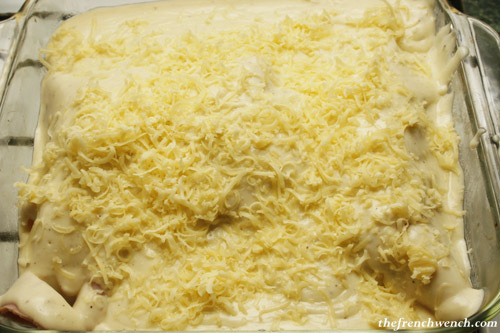 I always put a little bit of fresh (sour) cream in the bechamel as well as cheese and milk. Fanks Mum! Will try with the crème fraîche next time! Double yum! I’m sure I have had this at Franny’s, too. It’s now on my list of things to make in Warrnambool. Nice one Judith, let me know how you go, enjoy! I don’t think I’ve ever tried witlof cooked – definitely in salads and perhaps wilted but definitely not cooked as such. Does the boiling/steaming then baking process make it sweeter or does it bring out more of its bitterness? Hi Rita! I love them in salads too, with apples, walnuts, blue cheese/gruyere, sultanas, or with avocado, small prawns and a lemon mayonaise vinaigrette… yum! Boiling/steaming them makes them sweeter and less bitter. Oh yes, a summer salad of witlof with prawns, avocado and mayonnaise! Would work equally as well as canapes – you know how magazines show you to tear off each leaf to use as a “spoon”? To take out the bitterness while cooking I always put 2 squares of sugar as well as salt in in the pan ! I have never had witlof cooked. I am going to try this version, looks decadent. Two “o”s in Witloof. Dank U.
I thought both spellings were ok… aren’t they?